Free NSF to PST Converter is free software that firmly recover NSF file and convert NSF to PST file with extract each folders item. During NSF to PST Conversion process, the software preserves all lotus notes nsf file data and enable users to Export Lotus to Outlook PST, MSG, EMLX, MBOX, ICS, vCard, vCal, EML and CSV format. NSF Converter to PST Software is capable to convert any larger lotus notes NSF file data. 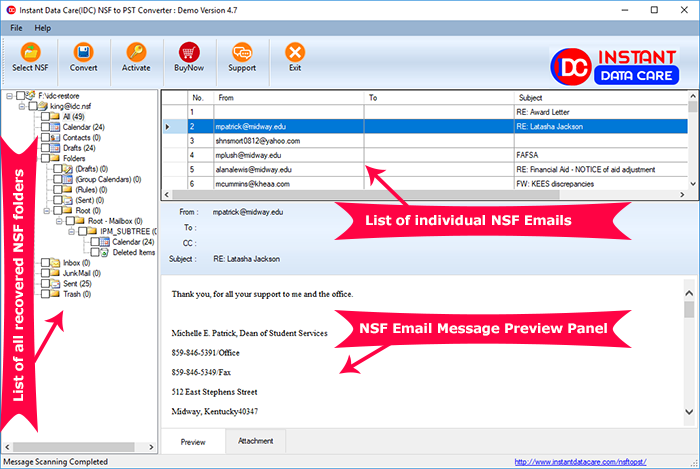 Completely scans NSF file, loads and preview all NSF emails, contacts, calendars etc. IDC Lotus Notes to Outlook Converter Software is an superlative NSF to PST Conversion tool which helps you to prominently recover notes nsf files and migrate users from Lotus Notes to Outlook PST file with all details. Software always takes care of every piece of NSF data migration during NSF to PST Conversion and keep intact its original NSF file folders and subfolders. 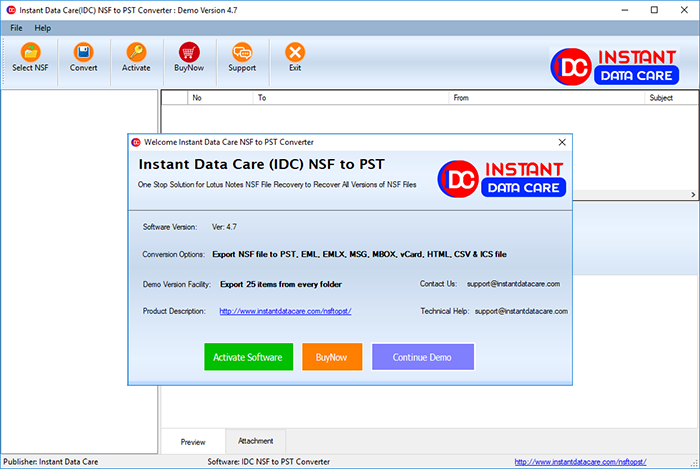 Instant Data Care Export NSF to PST Software provide ability to migrate NSF file to PST, EML, EMLX, MSG, MBOX, vCard (vcf), vCal and ICS file. Recently the company newly update the NSF Converter Software due to which now users are capable to convert NSF to PST and some different format also like- MSG, EML, HTML, EMLX, MBOX, ICS, vCard and vCal format. While conversion, the software preserves folders, sub-folders structure & emails meta properties like- bc, cc, subjects, date and time. For selective conversion of NSF files/ folders with this NSF to PST Converter software, all users are requiring selecting the NSF folders, file & convert all selected notes NSF file to PST outlook file and other format. 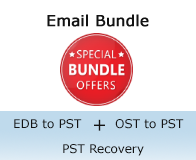 NSF to PST Software is result oriented program supports all lotus notes and MS Outlook versions to convert NSF to PST File. Free NSF Converter to PST Software uses easy & trouble-free steps for NSF to PST Conversion, it is safe and provides users facility to convert all names.nsf file into vCard, CSV & PST format along with extract each contacts detail like- first name, last name, emails address and so on. This is one of the good features that helps in converting only contacts file of lotus notes. Free NSF to PST Converter Software offers you big opportunity now you have chance to convert all calendars folders of lotus notes NSF file into vCal format. NSF Converter to PST Software auto search. nsf location & scans complete calendars items to transfer them into vCal format and any other formats that provided without altering in NSF file data. We know without preview it is difficult to believe on Software that is the reason we have added “LIVE PREVIEW” facility that enables users to watch out how software works to recover NSF file & convert NSF to PST and another format. It shows NSF emails, contacts, calendars, task, draft, inbox items, meeting, profile and other users mailbox items. 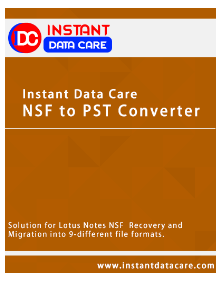 To install this Free NSF to PST Converter Software on your machine make sure your machine having installation of IBM lotus notes application of any versions such as- 9.1, 9.0, 8.0, 8.5, 6.5 and below versions and there is no dependency of MS Outlook application and it supports all MS Outlook versions from 97, 2000, 2002, 2003, 2007, 2010, 2013 and 2016. Supoprted Lotus Notes Version: IDC NSF to PST migration Software recover emails from Lotus Notes 9.0.1, 9.0, 8, 7, 6 files. Do I need to install lotus notes application to run this NSF Converter Software? Yes, there is requirement of installing lotus notes application on machine to run NSF Converter to PST Software to convert NSF to PST File. Can I convert any size of NSF File to PST & MSG format of Outlook? Yes, this NSF to PST Converter Software permits you to convert any size of NSF file into PST, MSG and other formats. Can I convert all names.nsf file to vCard with NSF to PST Conversion Software? Yes, with this NSF Converter to PST Software you can convert all names.nsf file into PST, CSV and vCard format. Can I convert selective folders of lotus notes NSF file? Yes, this NSF to PST Converter Software facilities that you can convert selective single and multiple NSF files/ folders with maintains each folders structure into PST and other format. Does NSF to PST Converter Software supports conversion NSF file in bulk? Yes, you can add multiple NSF files/folders in single conversion time and convert all of them into PST. I much appreciate this software and this software always helps in converting nsf contacts to vcf file. thank you..